This quartet has reunited after almost a decade. 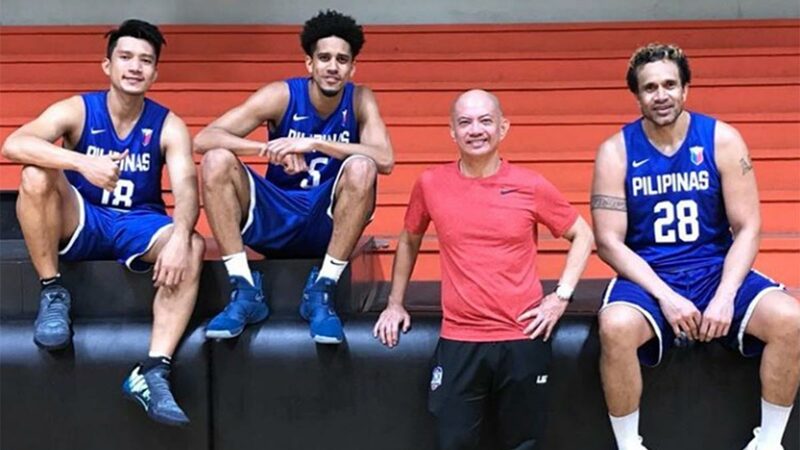 NEVER in Gabe Norwood’s wildest dreams did he expect that after nine long years, he would be reunited with his elders in Powerade Team Pilipinas. One of the youngest in that bunch at 24, Norwood was still learning the ropes at that time and has yet to turn to the versatile swingman he is now. But not everyone gets a chance to reunite like what they’re doing now. Fast forward to present time and here stands Norwood, waxing nostalgic as he’s side-by-side again with Asi Taulava and James Yap wearing the national tri-colors, with coach Yeng Guiao barking orders from the sidelines. They are tasked to carry the flag anew, this time for the 2018 Asian Games in Indonesia later this month. For the now-33-year-old Filipino-American cager, learnings from that experience will be valuable as they all eye to eclipse their performance in their first go-round almost a decade back. “That was my first experience playing for coach Yeng, and having Asi and James in that group, that was a good time,” he said. Back in 2009, Guiao enlisted a collection of PBA players which varied little in height, with the smallest standing at 6-flat to the tallest at 6-foot-11. Aside from Yap, Taulava, and Norwood, the roster was peppered with the who’s who of the league at that time, from famed guards Willie Miller, Jayjay Helterbrand, and Cyrus Baguio, forwards Arwind Santos and Jared Dillinger, to bigs Kerby Raymundo, Sonny Thoss, Mick Pennisi, and a young Japeth Aguilar. Though the team played their hearts out, they still performed below par, settling for an eighth-place finish, punctuated by an 82-80 heartbreaker at the hands of the nation’s longtime tormentor Korea in the battle for seventh place. Those boys no longer had a chance to redeem themselves as the Samahang Basketbol ng Pilipinas (SBP) decided to reboot the national team program and start from the ground up, leading to the formation of the first iteration of the Smart Gilas team. The players admit that the lackluster finish truly left a bad taste in their mouths even though almost a decade has passed. “Kailangan naming higitan yun,” said Yap, the two-time PBA MVP who rejoins the national team at age 36. Norwood echoed his E-Painters teammate's sentiment. And they vow that as hastily formed as this 2018 batch will be, the outcome will be a lot better thanks to the players’ better grasp of the system. “It’s gonna be different this time,” declared Taulava, now 45 and already with a three-point shot in his arsenal after playing back-to-the-basket for the longest time. “Mas may idea na ako,” stated Yap, who has fully embraced Guiao’s free-flowing system after getting traded to Rain or Shine back in 2016. People can talk about how short this team’s preparation has been, given only a little less than two weeks before the first ball is tipped in Jakarta. But for the remaining members of that ill-fated Powerade Team Pilipinas, this is a long time coming for them, a chance to complete what they feel is an unfinished business not just for themselves, but for their group as well.